Let’s get ready for their two Chicago shows at Otto’s tonight and the Hideout tomorrow, via this Q&A with guitarist Bill Bungeroth. You’ll be enlightened and surprised as Bungeroth explains the band’s “rollerskate approach” to live performance, why he gets inspired during live shows while surveying the body temperature of adoring female fans, why he loves sweaty Fugazi shows, and what JC Brooks does before the show starts. LF: How have your live shows influenced and inspired the recording of your debut album Beat of Our Own Drum, and your new single, “To Love Someone/Everything Will Be Fine“? BB: We’ve been playing both songs live in our set for awhile now, so they were definitely influenced by their live versions. For instance in its original from “To Love Someone” was slower. But our shows don’t have a lot of stopping, so even the ballads have to be pretty danceable to make the set. Even though it’s a ballad we decided the best tempo would be something you could dance or rollerskate to. It’s our roller skate ballad basically. The b side “Everything Will Be Fine,” is such a live staple that we needed it to build into a fever like it does when we play it our set. Which I think we did. Hot girls. Maybe some guys. It was the Subterranean in July 2007. We learned that we loved playing together, that we could get the audience to dance, and that we were really serious about becoming this band . We also learned that our first drummer thought our matching white pants were gay and promptly quit in the dressing room after. Nuremberg, 1934. We’d stop Hitler, destroy the Nazis, and then rock Germany. Fugazi at Congress Theater 1999. They were so sweaty and the audience was so sweaty by the end everyone looked inhuman. We love being up there with each other. At the end of the day we’re friends and watching your friends do the things they were meant to do is inspiring. As far as shows today, we try to bring a more theatrical show to the stage that’s what James Brown did and people have forgotten to do. There has to be something worth watching on stage. Raw emotion channeled into a visual spectacle. It’s why we wear the suits, choose new covers, breakdown our songs, have audience interaction, have dance moves. You paid for a show and to me that’s more than “look how good I am at playing”. JC Brooks is usually asleep until 5 minutes before the show. You’ll be playing Otto’s and The Hideout this week, and you’ve played in many other unique venues and settings around Chicago. What do you do to adjust as you play in different venues and for different crowds in various cities? We constantly adjust and tweak. We try to play diverse sets with an ever rotating set list. Sometimes we add more rock sometimes more soul. But we’d like to think we are just as intense at a big venue as at a campus bar. Thanks again to Bill and the band for taking the time to chat! 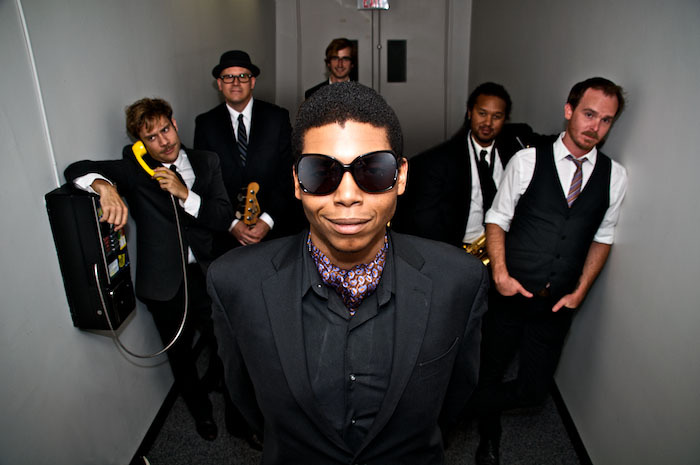 Check out the JC Brooks and The Uptown Sound website for more tunes and stuff.